Apologies for the long radio silence. Last year was a bit buried in book tours and just enjoying married life. (Wedding pics here if you haven’t seen them yet.) This year has been great so far, with flying trapeze lessons and a surprise birthday gift from Jon Stewart. And it’ll bring many changes, including a big move (we’re leaving New York) and a road trip book tour with my husband (in the mid-South). My last tour of 2013 took me through Upstate New York, Canada, and the Midwest, with a very quick stop in Tulsa to interview with Teresa Miller on “Writing Out Loud,” a PBS program. It aired on January 13. It was one of my favorite interviews of the year. You can view it at this link. I got a little Christmas money, so I found a trapeze school in NYC and signed up for two lessons. The first time I did it, I was swimming in adrenaline for hours. The second time, I was able to calm down and learn a pretty neat release trick (straddle whip) and be caught in midair. Ahmed took videos, and you can see a short highlight reel here. I’ve also been beefing up my website with resources for people interested in going further after reading Fast Times in Palestine — learning more, visiting the region, or becoming active in the struggle for justice. I finished half the Chapter Companions and posted links to every section that’s been cut from the book. You can find it all here. As for the big move: Ahmed and I are leaving New York at the end of February and heading to Tulsa! He wants to switch careers from finance to soccer coaching. I think it’s a much better fit for him, and he’s been volunteering, working, and studying toward that end for quite a while. Tulsa is a good soccer town, and I’ll be happy to be near many good friends and family, with clean air, big skies, and an abode larger than a shoebox. Gorgeous sunsets, grass, lakes, thunderstorms, the Big Splash water park, cousins, nephews, and a much calmer environment in which to write. Sounds great to me. Finally, I’ve been invited to give talks in Louisville and Lexington, Kentucky on March 19 and 25. We’re planning on making a road trip out of it, and swinging through other states and cities as well. So if you know of anyone in Missouri, Kentucky, southern Ohio, Tennessee, Arkansas, or areas nearby who might wish to put together an event with me in March about my book, writing, or Palestine in general, please let me know. Or just friends who might like to meet an Okie and a Turk along the way. Thanks so much and lots of love! So, Ahmed and I are leaving New York at the end of February and heading to Tulsa! He wants to switch careers from finance to soccer coaching. I think it’s a much better fit for him, and he’s been volunteering, working, and studying toward that end for quite a while. Tulsa is a good soccer town, and I’ll be happy to be near many good friends and family, with clean air, big skies, and an abode larger than a shoebox. We’ll be there for at least the next few years. Really excited. After three years, Ahmed will have his citizenship and we’ll be free agents. It’ll be interesting to see where his career is by then, and where it might take us. Luckily I can write anywhere — and hopefully by then I’ll have another couple of books under my belt as well. Finally, I’ve been invited to give talks in northern Kentucky in mid-late March. We’re thinking of making a road trip out of it, swinging through other states in the area that might be interested in hosting me for a book talk. I don’t have time to do the outreach and organizing this time. But if you know of anyone in Missouri, Kentucky, southern Ohio, Tennessee, Arkansas, or areas nearby who might wish to put together an event with me in March about my book, writing, or Palestine in general (or just friends to meet along the way), please let me know. And please feel free to send this link to anyone who may be interested! For the past few months, I’ve been beefing up my website with resources for people interested in going further after reading Fast Times in Palestine — from learning more to visiting the region to becoming active in the struggle for justice. I’ve also finished around half of the Chapter Companions and posted all of the sections that have been cut from the book for reasons of length. I hope you’ll find it useful, and if so, spread the word! I got a Birthday Present from Jon Stewart! OK, it’s not quite as awesome as it sounds… but pretty awesome. So I still haven’t fulfilled my dream of appearing on the Daily Show. My publicist tried to get me on — no luck. I mailed the Daily Show a copy of my book with a nice letter — no luck. I watch his show like every single night — he doesn’t even seem to notice. Whatever. I hike in the snow to get my ticket, wait in a godforsaken Subway Sandwich shop for two hours, wait out in the snow again to be let into the studio, and I’m one of the last 20 people who make it in by the skin of our teeth. In the back row. Of course. “Ah. Nice. Thanks. Anyway, we gotta get started…” And soon the show began and the cameras were rolling. Sadly, the pre-show Q&A is not televised. But here’s hoping Jon is at home reading my book right now… Hey, a girl can dream! Happy 2014! I have a lot of really good feelings about this year. The BDS campaign is massively ramping up, in snowball fashion, I have some nice talks coming up in Louisville, Portland, and hopefully Scotland, and my book is still selling well and getting great feedback. My husband and I are getting ready for a big move, and I’m working on two more books — a novel and a sequel to Fast Times. We’re also thinking of doing a road trip in March through Missouri, Kentucky, possibly Ohio, Tennessee, and the Deep South and doing as many book talks as we can organize, if anyone has contacts in those areas. (If we get really ambitious, we might try to include the Virginias and Carolinas as well.) My husband will be with me, which will be really nice! The worst part of most book tours is missing him. In the fall I was interviewed on “Writing Out Loud,” an Oklahoma program on PBS that interviews authors such as Khaled Hosseini and Dan Rather. It aired on January 13. You can watch the 27-minute interview at this link. It was one of my favorite interviews of the year. 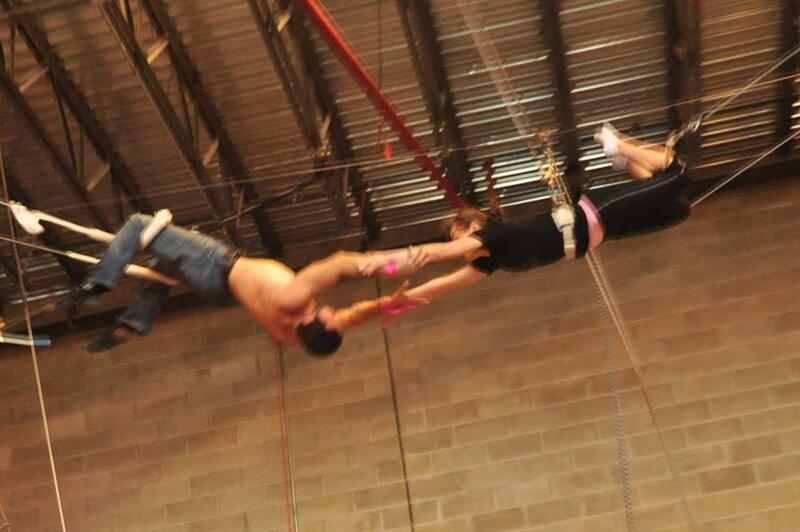 Finally, just for fun, I used my Christmas money this year to take two Flying Trapeze lessons. It was more fun than I could have imagined — highly recommended. Here’s a short video of me doing the most advanced trick I was able to learn (straddle whip).